Trilby is definitely the IT item for the upcoming winter. Victoria Beckham has made it first to wear it, and her celebrity followers caught up pretty quickly. 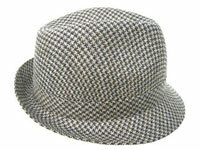 British journalist William Norman Ewer had the nickname Trilby because he was known to wear the hat. The trilby was also often worn by Inspector Clouseau, the character portrayed by Peter Sellers in the Pink Panther film series. So wearing a trilby stands for being smart, witty, sophisticated and the most important – FUN! Hilary Duff isn’t such a good example, as her trilby isn’t as glam as the one Kate Walsh is wearing. Anyways, it doesn’t even matter what the IT item is – what matters is how you wear it. Hillary was making her way to the hotel in Manhattan on Sunday evening, carrying two puppies in her black bag.